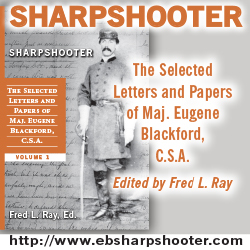 This is the second review for the second release of titles in the South Carolina Regimental-Roster Set series from Broadfoot Publishing Company. A significant portion of each review will show you how this particular volume compared to the others in the series in terms of regimental history length, amount of annotation, depth and print size of rosters, bibliography, illustrations, and maps. 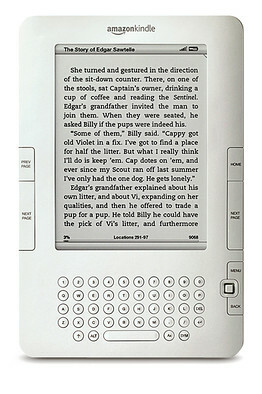 I do this to show readers just how different each volume can be. The South Carolina Regimental-Roster Set bears a striking external appearance to the H.E. Howard Virginia Regimental Histories series. These books were, in fact designed as a South Carolina answer to the Virginia unit histories. Broadfoot hopes to publish 50 volumes in this set, and has announced all 50 will be published due to the interest in the first four books. If you are interested in regimental histories, especially those from South Carolina, I encourage you to pick up these volumes immediately. Davis, Sam B. 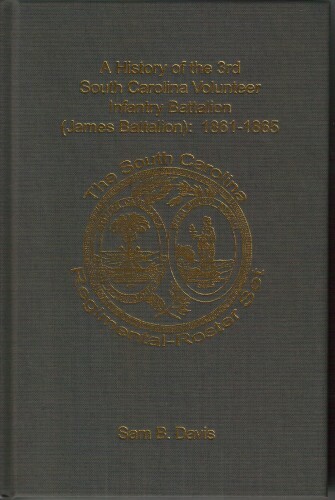 A History of the 3rd South Carolina Volunteer Infantry Battalion (James Battalion): 1861-1865 (2009). 549 pages, photos, maps, roster, notes, bibliography. ISBN: 978-1-56837-413-0 $40.00 (Hardcover). Sam Davis’ A History of the 3rd South Carolina Volunteer Infantry Battalion is part of the second release of books in Broadfoot Publishing’s new South Carolina Regimental-Roster Set series. The large number of maps and illustrations along with the lengthy and interesting regimental history combine with the impressive roster to provide a first rate history of the James Battalion. Author Sam Davis was born in Laurens, South Carolina, a town which provided many soldiers for the 3rd South Carolina Battalion. Three great great grandfathers fought in South Carolina units during the Civil War, including one in the James Battalion. The regimental history portion of the book is just barely second in length in the entire series, weighing in at a hefty 324 pages. Only Jim Clary’s book on the 15th South Carolina beats it, and only by two pages. Davis does a good job of following some of the members of the regiment over its four years of service. He makes readers want to follow these men through numerous major battles across several theaters if war. The 3rd South Carolina Battalion found itself in many different battles and other situations during the war. Raised in South Carolina, the battalion didn’t reach the main Eastern Theater area around Richmond until late July 1862, where they were assigned to Thomas Drayton’s brigade. The unit mostly missed Second Manassas due to a mistake by Drsyton. When the unit finally saw its first real combat at South Mountain on September 14, 1862, they were caught in a roadbed and subjected to a devastating flanking fire. As a result, the James Battalion was down to fewer than 40 men at Antietam. After that battle, the 3rd battalion and the 15th South Carolina were transferred to Kershaw’s Brigade, where they remained for the rest of the war. The James Battalion saw combat at Fredericksburg and Chancellorsville, and were involved in the bloody fighting at Gettysburg’s Peach Orchard on July 2, 1863. Transferred rest with most of Longstreet’s Corps, Kershaw’s Brigade fought on the slopes of Snodgrass Hill on day 2 at Chickamauga. After the failed Siege of Knoxville, the 3rd spent the winter in Russellville in eastern Tennessee. The next spring brought the massive bloodlettings at the Wilderness, Spotsylvania, North Anna, and Cold Harbor. Kershaw’s Brigade was routed out of a redoubt on the north side of the North Anna River, and surprisingly lost no men in the famous June 3 assault by Union troops at Cold Harbor. The 3rd spent the latter half of June 1864 reacting to threatened danger from Union troops at various points in the Confederate trenches around Petersburg. They were driven back from Tilghman Gate on July 27 during the First Battle of Deep Bottom. In early August, Kershaw’s men were sent to the Shenandoah Valley to augment Jubal Early’s Valley Army. The only major battle they were involved in during their stay was the famous Battle of Cedar Creek. The 3rd left the Shenandoah along with the remainder of Kershaw’s Brigade on November 19, 1864. The South Carolinians spent most of the rest of the war trying in vain to stop Sherman’s march through the Carolinas, and they surrendered with Joe Johnston’s army at Greensboro, North Carolina on April 26, 1865. The sheer number of maps and illustrations in this book is tremendous and a credit to both the author and publisher. By my count, the book contained 38 maps and at least 75 illustrations, including many pictures of battalion members. Davis borrowed some maps from fellow South Carolina Regimental-Roster Set author Jim Clary, and procured maps of South Mountain and Antietam from Kurt Graham. Many maps from the South Carolina Department of Archives and History are also used. Taken as a whole, the maps do a great job of showing readers where the unit fought in relation to the rest of the brigade and to the enemy. Too many times, unit histories skimp on maps, especially when trying to show exactly where a unit fought in a major battle. Happily, this book’s maps are taken to the opposite extreme. The roster, the main reason this series came into being, is pretty standard for these books. In other words, it is extremely detailed, easy to read, and greatly facilitates research on men who served in the 3rd South Carolina Battalion. The roster is organized in alphabetical order by last name for the entire regiment. The roster is not broken down by company but company affiliation for each man is prominently noted. Readers interested in the battalion will want to own a copy of this book for the roster alone, though the battalion history is also well done. The book contains 35 pages of notes and a 20 page selected bibliography, providing deep readers an opportunity to do further research on the battalion. The author clearly did his research, with a wide variety of sources including unpublished letters, diaries, and manuscripts, newspaper articles from the Civil War era, and many other primary and secondary sources. A History of the 3rd South Carolina Volunteer Infantry Battalion offers readers a detailed unit history and an equally detailed roster of the 3rd South Carolina Battalion. Sam Davis’ text combined with the plethora of maps and illustrations makes this one of the better entries in the South Carolina Regimental-Roster Set to date. Readers collecting all of the books in this set will find in this book a first rate military history of the James Battalion. Those who have ancestors from the James Battalion will want to own the book for its detailed roster as well. If you are interested in trying one book from the series, this would be a fine place to start. NOTE: This is my second review of the second release of three books in Broadfoot Publishing’s South Carolina Regimental-Roster Set series. You may be interested in my reviews of the first four volumes in this series as well as interviews with authors Mac Wyckoff and Lee Sturkey. Check out the related posts links at the bottom of this title to see more on this series here at TOCWOC – A Civil War Blog.